Surrounded by nature and boasting spectacular views of the ocean and Pedra da Gávea, this totally private 13,670 square feet residence was redesigned by the renowned Brazilian architect Helio Peregrino. In the first level the amenities are divided into entrance hall, living room, dining room with fireplace, open verandah, half bath, media room, private room, breakfast room, home office, beautiful internal garden, bar, library, large kitchen, eating area, pantry, cupboard, service area and two staff quarters. The second level provides entrance hall, open verandah, breakfast room, home office, six spacious bedrooms, featuring four of them en suite bathroom, the master suite with walk in closet, four full bathrooms and mezzanine. The house also counts with a wine cellar in the basement. With a total area of 1.27 acres, the excellent and sunny external area is composed by terrace, lawn, lake, sauna, caretaker's house with two bedrooms, kennel and parking space for up to twenty cars. 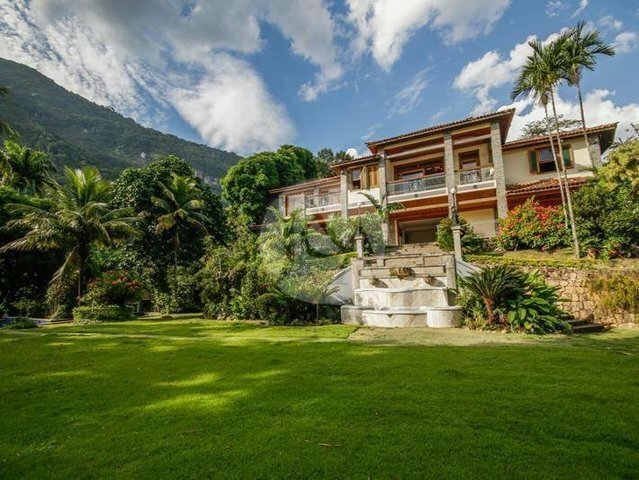 This property is the perfect combination between luxury and tranquility.